For Danish pop and R&B singer-songwriter, Medina, this fall has been dedicated to her extensive Danish tour Tæt På. 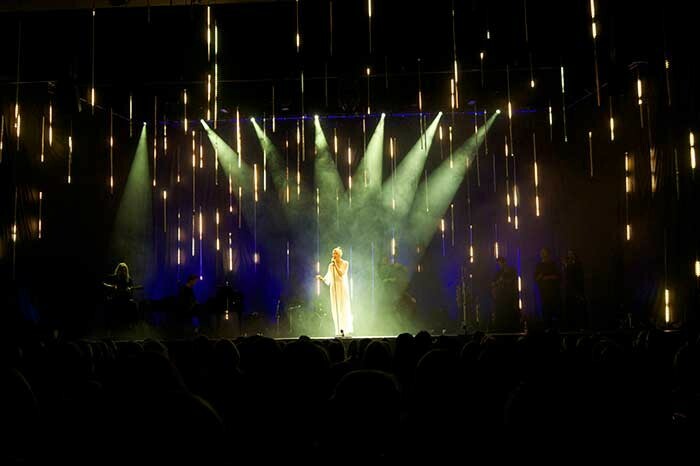 Medina’s lighting designer, Søren Peglau, selected both variants of SGM’s LED tubes for his design creation: 150 pcs 1-meter LT-100 and 50 pcs 2-meter LT-200, specifically acquired for this tour by rental company Comtech. Peglau’s vision was to place the tubes in various heights and depths to fill out the stage and make it seem random and unintentional. 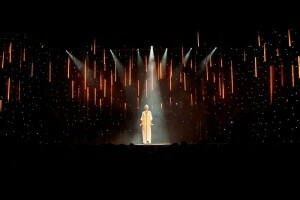 “The effect I was looking to achieve was for the lighting to drizzle down over the musicians. For this, I created content that moved vertically in a slow mode”, states the designer, who for other pieces of music also produced a slow-running fire effect for the tubes. Also the audiences were invited to become ‘immersed’ in the setting, with tubes hanging over their heads, for which purpose the SGM tubes were ideal with their two sides of pixels creating a 3D effect. The atmosphere generated by the LED tubes reduced the need for moving heads, spots and floor lights down to a minimum. On many tracks just a single spot was used for the artiste as well as for the band. With many different venues on the tour, the LED pixel tubes presented clear advantages for Peglau. “I find them stylish and robust, while bringing another huge advantage to the table: their weight – or nearly non-existent weight. Due to this, we could suspend the tubes from their cables and make rigging more efficient and less visible”. The LD used SGM’s ILD (Installation LED Driver) with ArtNet and mapped the pixels with a Coolux Pandora Player Box. Evaluating the tubes on what had been a fantastic tour, Peglau describes them as “incredibly robust”, performing flawlessly throughout the tour, and he appreciates the flexibility and ease of working with the products. 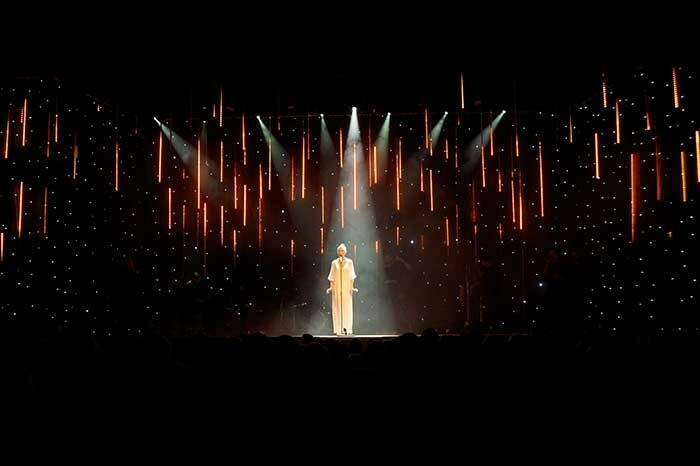 “The feedback we have received has been amazing based on lighting design, execution and the show as a whole. Many people have told me that they found the setting to be astounding, beautiful and stylish”. For Peglau, working with SGM products has become a frequent occurrence. While currently away on another big tour with artist Burhan G., he is now planning the design of upcoming awards shows, which “most likely will include a ceiling of LED tubes”, he smiles.